Haalim Episode 4 is a new part of nimra ahmed's new novel, it is her latest novel just after namal, halim is currently publishing in monthly khawateen digest in form of monthly serial novel, as well as previous novels, nimra ahmed write this novel for youth and she chosed very core topic of the society, currently you are reading Haalim episode 4, we hope you will enjoy this novel as per past experiences. is a new part of nimra ahmed's new novel, it is her latest novel just after namal, haalim is currently publishing in monthly khawateen digest in form of monthly serial novel, as well as previous novels, nimra ahmed write this novel for youth and she chosed very core topic of the society, currently you are reading Haalim episode 4, we hope you will enjoy this novel as per past experiences. 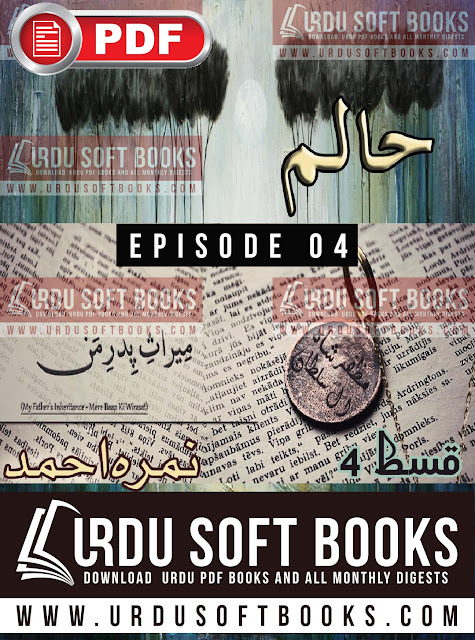 You can read online or download high quality file of Haalim novel episode 4 in PDF format for offline reading, if you are using smartphone you have to need install any PDF viewer before downloading Haalim episode 4 PDF file. You can try the Google PDF Viewer for smartphones.